This list includes about 180 new items- lots of good,usable tools including lots of good edge tools, some good saws, planes, and molders, as well as lots of books. The couple of remaining items from last time have been marked down. This is my first try at this using the new email service. The test message I sent out last week worked fine. Let’s hope this one goes as smooth. I’m also completely up on Google Apps for all of my email, eliminating a local mail server that might have been the cause of the delays I experienced last time. Fingers crossed.. let’s hope for the best. Thanks for your patience in waiting for this list. I had to postpone it a couple of times due to unexpected road trips to pick up collections of tools. This list is packed with some great user tools. I’ve happened upon a mother lose of some of the finest chisels and gouges I’ve ever seen. Many of these are on today’s list, others will be listed in the coming weeks. This is a big one- more than 250 new items. I don’t expect to be able to reply immediately on my limited lunch break this afternoon. So don’t worry if you don’t hear from me right away. All emails will be answered in the order they arrived. Jsut a quick note to let you know there is a new list of old tools for sale here: http://hyperkitten.com/tools/ForSale/Tools_FS.php Lots of great user stuff- planes, saws, edge tools, some excellent books. There’s also a complete Stanley 444 if you are looking to fill out your collection. I hope you find something you like. I’m in a rush today so no time for other news.. Follow me on Twitter @HKToolCo for mildly interesting photos and other stuff. Happy Summer! It’s a beautiful day here in CT, warm, dry, and breezy. I added about 160 new tools to my For Sale page today- you can see them here: http://hyperkitten.com/tools/ForSale/Tools_FS.php The list includes a number of excellent edge tools, a few Stanley planes, some great molders, some vintage Scotch braces paired with bits, and lots of other fun stuff. Have a look and drop me an email if you see something you like. Around here we’ve been enjoying summer to its fullest. I took a week off work to take some day trips with the kids. We enjoyed an overnight trip to Mystic, CT, several trips to the beach, and some good fishing. All of this fun put me days behind on email. I haven’t had a chance to catch up with it all yet so if you are still waiting for a reply I’m doing my best. Feel free to follow-up to make sure I received it. I’m doing all I can to keep up with requests for tools. I just took in two large collections and several boxes of consignments. My web host recently upped my disk space quota. Taking advantage of the new space, I have started offering 60% larger photos of each tool. I hope this makes up for my mediocre photography. If anyone out there is interested in bucking and felling crosscut saws, both 1-man and 2-man please send me an email. I used to sell these on eBay but I’d like to avoid doing that now.. I have a decent number of good, usable saws for sout masters, forestry folks, or anyone looking to stop up on logging tools ahead of the zombie apocalypse. Starting this month I’m going to experiment with email invoice through Quickbooks. I will continue to include paper invoices in my shipments. If you get an email invoice please feel free to provide feedback. The next tool list is scheduled for Wednesday, August 6. I put up my first list of tools for this summer. You can see the new stuff here: http://hyperkitten.com/tools/ForSale/Tools_FS.php This list includes about 160 new items including a huge bunch of nice edge tools, a few Stanley planes, some backsaws, boring tools, etc. I’ve had a lot of interest in dividers and side beads lately so I’ve tried to list as many as I can to satisfy the demand. I have lots of tools in stock and more on the way so please let me know if you are looking for something specific. A note on email- email communication is unreliable. Messages are sometimes delayed by several minutes, hours, or even a day or more. There’s no reason behind this, messages just get stuck at one mail hop or another. I’ve heard more and more complaints lately that messages to/from me are taking too long to arrive. I would highly recommend sending messages to both of my addresses: jclark@hyperkitten.com and jclark42@gmail.com to increase the chances that one gets through to me in a timely manner. I hope everyone is enjoying their summer so far. With our youngest now 2 years old we’re doing more on our free days. Our little town beach on the river is always a popular destination- my oldest daughter can now make it out to the dive platform which is a big deal around here. Our town’s fireworks are scheduled for tonight and we’re planning on a day trip to Mystic, CT next week. The bass are still biting (caught two in a short 5 minute fishing trip last night!) and the garden is looking good so far. I’ve been brewing more often lately with good success. I have a stout and pale ale in the fermenters, a Steam lager in the secondary, and a wheat beer jut finishing up bottle conditioning. I also finally bottled the hard cider I made last fall. I’m set for refreshment for a while. It should be a fun summer- I hope yours is too. If I can get some problems with my web host resolved I will be adding another 20 or so books and vintage catalogs to the list. Look out for my next update on Wed, June 25. In the mean time please contact me by email if you have any specific requests. I put up a batch of some 120+ fresh old tools on my For Sale page today. This list includes a bunch of Stanley planes, some toothing planes, drawknives, bunches of good edge tools, some vintage books and catalogs, and lots of other fun stuff. I hope you find something you like! Around here Tool Season is in full swing. My stock room is packed with all sorts of interesting tools. I’m working hard to fulfill all of the requests I have on file for specific tools. If you are looking for something in particular please let me know! Around here the weather has been beautiful and the spring rain has the rivers flowing nicely. Fishing season is open and I’ve been able to go out with my daughter twice so far. 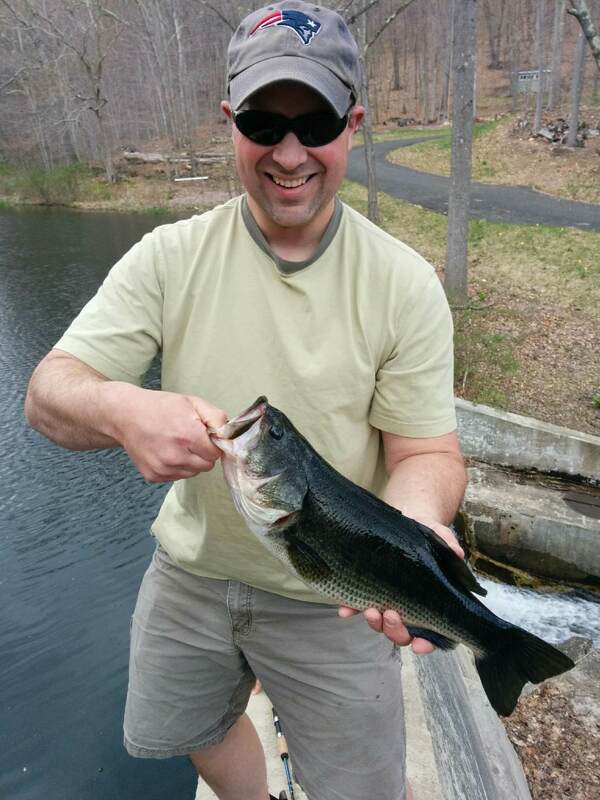 We’ve caught a couple of decent brown trout and a really good bass (really good for a Connecticut) on Saturday. Last time I wrote that spring was finally here. A few days later we had a snow and ice storm. Today it’s in the mid 70s, the daffodils are in full bloom, and the peepers are chirping. Spring is really here this time. I hope. Today’s For Sale List includes a large number of tools- some 140+ planes, edge tools, molding planes, saws, etc. There’s lots of good stuff here including some barely used modern saws, a complete Stanley 55, a decent user set of hollows and rounds, as well as assorted other interesting bits. There’s lots of fun stuff. I hope you find something you like. Spring has finally sprung. It’s almost 60 degrees here today. The daffodils are coming up, and almost all of the snow has melted. I’ll make this short- I added a large number of quality old hand tools to my For Sale page today. You can see it here: http://hyperkitten.com/tools/ForSale/Tools_FS.php This list includes some top quality handsaws freshly sharpened and in ready-to-use condition from my own collection, some excellent early 18th century molding planes, measuring and marking tools, and lots of Stanley planes. I hope you find something you like! I put a lot of about 100 new old tools up on my For Sale page today. This list includes a large number of quality edge tools, some nice complex molding planes, a few metallic bench planes, drills and boring tools, and other fun stuff. I’m also sorting through some recent auction winnings and two collections of tools coming in shortly so you will see lots of quality working hand tools coming up in the next few weeks. Around here it seems like winter is finally ending.. We are down to about 12 inches of snow covering most of the ground. It’s hard to believe the daffodils will be coming up in less than a month!